As an expectant mother you are entitled to certain priority foods, essential for your own and your child's health. As soon as you have a certificate from your doctor, health visitor or certified midwife, take it or send it with your own ration book to your Food Office. You will then be given a green ration book (R.B.2) modified to meet your special needs. You can start to use this, in addition to your own, directly you have registered with yours shops. MILK: 7 pints a week - at reduced price of 2d. a pint under the National Milk Scheme, or free, according to income. This is in addition to the ordinary allowance of milk on your own ration book. EGGS: Two shell eggs at each allocation; one on the green book and one on your own. DRIED EGGS: Six packets every four weeks; four on the green book and two on your own. MEAT: A half ration of meat on the green book in addition to the full ration on your own. CONCENTRATED ORANGE JUICE: You can get this at welfare centres, clinics and food offices. A six-ounce bottle costs 5d. You should take a tablespoonful in water every day. COD LIVER OIL OR VITAMINS A & D TABLETS: You get these also at welfare centres, etc. A bottle of cod liver oil costs 10d, and last six weeks. Tablets are 10d for 45. Take a teaspoonful of cod liver oil or one tablet every day. If you are entitled to free milk you will also get cod liver oil (or tablets) and orange juice free. When your baby is born and the birth has been regisered, take or send both your own ration book and the green ration book to the Food Office. They will be altered to allow the following extras: MILK: The mother of a child under 12 months is allowed 7 pints a week (at full retail price) on her own ration book. The child gets 7 pints a week on his green ration book, at the reduced price of 2d a pint, or free, according to income. 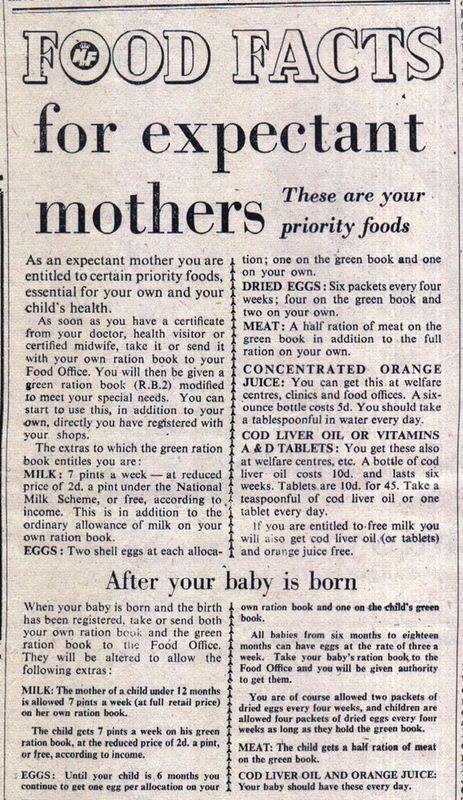 EGGS: Until your child is 6 months you continue to get one egg per allocation on your own ration book and one on the child's green ration book. All babies from six months to eighteen months can have eggs at the rate of three a week. Take your baby's ration book to the Food Office and you will be given authority to get them. You are of course allowed two packets of dried eggs every four weeks, and children are allowed four packets of dried eggs every four weeks as long as they hold the green book. MEAT: The child gets a half ration of meat in the green book. COD LIVER OIL AND ORANGE JUICE: Your baby should have these every day.